CBI is now a member of the ALEPH Network, a network of creative, innovative, and heart-centered Jewish institutions, nonprofit organizations, and communities around the world. Here’s information on two upcoming online classes which will be offered by ALEPH — one taught by our own Rabbi Rachel. These courses are open to everyone, and you can participate from the comfort of your own home (as long as you have an internet connection). The Hebrew word Tikshoret comes from the root for “deep connection,” and that’s what these classes are designed to be: an opportunity to connect with the riches of our tradition. These exciting classes will be taught by teachers and rabbis from across the Jewish Renewal world. Through this highly accessible online platform, we seek to inspire, engage, challenge, and explore the mysteries of the past with an eye towards contemporary spiritual practice and creating personally meaningful Jewish experiences. We hope that you will join us on this sacred journey! The psalms are a deep repository of praise, thanksgiving, grief, and exaltation, one of our communal tools for connecting with God. In this class, each of us will become a psalmist. We’ll awaken our spirits and hearts by praying select psalms together, warm up our intellectual muscles with writing exercises, and enter into a safe space for creativity as we each write our own psalms. After sharing our psalms aloud and sharing our responses to each others’ work, we’ll close by davening together once more. How much do you really know about the Biblical Eve and mythical Lilith? In this participatory 4 part class we will draw on archaeology, ancient ethnographies, actual Biblical text and midrash as we deeply “rediscover” Eve and Lilith and their connections to the ancient Divine Feminine. Please note: All texts will be taught in translation, no Hebrew background is necessary. Hazzan-Magid Steve Klaper, Rabbinic Pastor Dr. Simcha Raphael, and Rabbi David Zaslow. I’m writing this morning to let you know about three wonderful things which will be happening in our community over the weekend of February 26-28. CBI is joining with Rimon and Temple Anshe Amunim to present a visit to the Berkshires from Rabbi Jill Hammer, co-author of The Hebrew Priestess, a groundbreaking book about women’s spiritual leadership from antiquity to today. Rabbi Jill will speak at 7pm on Saturday February 27 at Temple Anshe Amunim, 26 Broad Street in Pittsfield. She’ll read from the book, talk about how it came to be, answer questions, and sign copies of the book. Don’t miss this! Local resident (and nationally known singer / songwriter) Bernice Lewis will present a workshop on “How to Write a Jewish Love Song,” co-presented by Jewish Federation of the Berkshires. 11 a.m. to 2 p.m. Sunday February 28, $10.00, includes a kosher style buffet lunch. Bring your instrument or just your voice. Bring a smart cell phone to record your song, and a notebook and writing tool! Bring your sweetie! RSVP’s requested by February 24 tooffice@cbiweb.org or by calling (413) 822-5267. I hope you’ll join us for some or all of these special happenings at CBI. Shavua tov; looking forward to Shabbat Yitro. 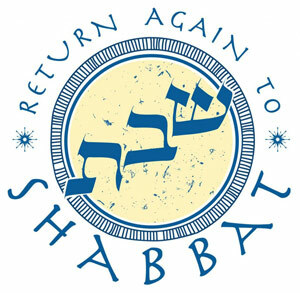 Join us on Shabbat morning at 9:30am for services led by Rabbi Pam Wax where we’ll read from parashat Yitro. And here’s the URJ’s compilation of commentaries on this week’s Torah portion: Yitro. Shavua tov! Looking forward to Shabbat Beshalach – and Tu BiShvat! Join us on Shabbat morning at 9:30am for services where we’ll read from parashat Beshalach. 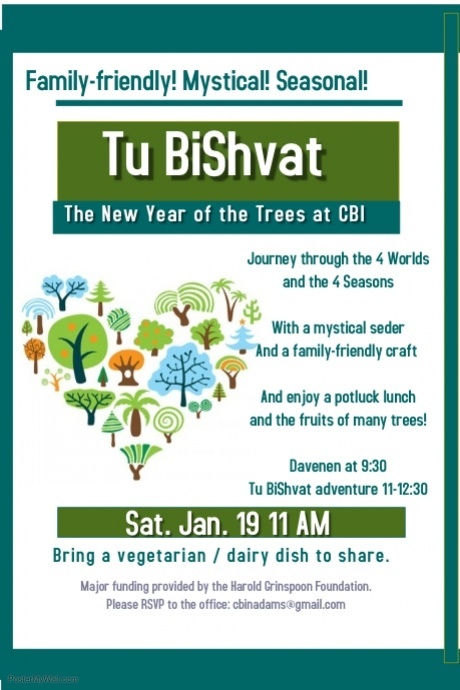 And join us at 11ish am for our Tu BiShvat Seder, our celebration of the New Year of the Trees! We’ll journey through the Four Worlds and the four seasons, experience prayer and poetry and song, and enjoy many fruits and nuts which come from trees. This year we’re using a new haggadah assembled by Rabbi Rachel which will be projected on a big screen (to save paper – in celebration of the trees) — shared as part of ALEPH’s year of recommitment to deep ecology, seeing our living planet as a holy Temple in need of care. Please RSVP to the CBI office ASAP so we know how many chairs to set up! And here’s the URJ’s compilation of commentaries on this week’s Torah portion: B’Shalach. This is the d’var Torah which Rabbi Rachel offered yesterday at CBI. In this week’s Torah portion, we read the instructions which came before the Exodus from Egypt. Slaughter a lamb, the people are told, and mark the doorposts of your house with its blood as a gesture of protection against the tenth plague. Roast it, and eat it in haste, with your sandals on your feet and your staff in your hand. I’m always struck by that injunction. Today’s equivalent might be eating the feast with our suitcases packed and our car keys in our pockets. The spiritual meta-message is: have what you need with you, because at any moment it might be time to go. Just a few weeks ago we read God’s instruction to Moshe to remove the sandals from his feet — or, in my favorite Hasidic interpretation from the Baal Shem Tov, relinquish his habitual way of doing things — because the place where he stood was holy ground. We removed our shoes and made ourselves vulnerable. Today we’re being told to put our shoes back on. To get ourselves ready to go. What can we make of these two sets of instructions? Maybe they can speak to us about two qualities of life. Put on your shoes and be ready to go: that’s weekday consciousness. We have to close ourselves up a little bit, protect our tender places, in order to function in the world. Like the children of Israel getting ready to leave Egypt, we need to have our act together and be ready for whatever journey lies ahead. Sometimes it’s a physical journey. And even when we’re not going anywhere, we’re on an emotional and spiritual journey of learning, and growth, and change. Weekday consciousness says: put on your shoes and be ready to hit the road. Take off your shoes, remove your habitual ways of seeing and being, because the place where you stand is holy ground: that’s Shabbat consciousness. Shabbat is a time when we don’t do work, we don’t try to change things, we just sit with what is and find joy therein. In weekday consciousness we work, we strive, we travel, we change. In Shabbat consciousness we sit still and experience the Oneness behind all multplicity, the connection which underlies every separation, the togetherness with God which is manifest even when we are seemingly alone. Shifting from one of these states to the other isn’t always easy. I remember the very first time I went on retreat at the Jewish Renewal retreat center Elat Chayyim, some fourteen years ago. I spent a week there in community, davening three times a day, meditating, learning, praying, singing, opening my heart in ways it had never been opened before. It was an amazing experience, and a transformative one. And then I left the retreat center and went to drive home, and the first thing I did was stop to gas up my car. I walked into the convenience store with my heart wide open, beaming, because that was the way I had grown accustomed to being over my week on retreat. I don’t remember what the clerk said, but he was curt, and I felt like I had fallen from heaven down to earth with a thud. I hadn’t put my emotional “shoes” back on. I didn’t yet know that after every retreat, there is a period of re-entry during which I have to re-learn how to wear the emotional armor which usually protects my spirit and my heart. Whole-hearted encounter (with God, with holiness, with something beyond ourselves) requires us to take off our shoes. It requires us to remove our habits and the protective coverings which usually separate us from the world. And by the same token, being in the world may require us to put our shoes back on. To not let our most tender emotions be on display. To keep the world a bit at arm’s-length, in order that its routine slings and arrows not be completely devastating to our hearts and our souls. During the week, we need to put on our shoes and be ready to go. On Shabbat — and at times when one is fortunate enough to be on retreat in spiritual community, if that’s something you ever get to do* — we can take off our shoes and just be. Take off the protective calluses which usually separate us from the world. Take off the habits which keep us from living in the moment. How does that feel for you? And tonight we’ll make havdalah, and the scent of the spices will be like smelling salts for the soul, energizing us to return to the weekday journey of making, doing, becoming. When you put your shoes back on and pick up the yoke of the new week, what journey will you undertake — and how will it be informed by the spaciousness of the pause which Shabbat brings? *allow me to recommend the ALEPH Kallah in July, for which preregistration has just opened! Join us on Shabbat morning for services where we’ll read from parashat Bo. And here’s the URJ’s compilation of commentaries on this week’s Torah portion: Bo.